One of the coolest aspects of avant-garde classical music joining forces with experimental music and improvised noise is the way that the various instruments are taken out of context, forced to expand their sonic vocabulary and discovering new nuances and techniques along the way. 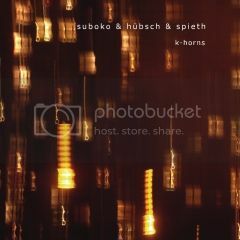 On 'K-Horns,' Suboko, a trio of French percussionists, are joined by Carl Ludwig Hubsch on tuba and Roland Spieth on trumpet, to create five tracks of rumbling metal, hissing breath, and obscure sci-fi textures from God Knows Where. The overall effect is of listening to some mutant jazz festival in an old warehouse, while rain beats down on the corrugated tin roof, and a flying saucer smoothly descends into the vacant lot next door. Oh yeah, there are mechanical rodents running around in the walls, broadcasting slowed down Hitler speeches through tiny tinny loudspeakers, also. Sounds surreal? It is. 59 minutes of improvised symphonic textures may not be to everybody's liking. There's nary a melody or rhythm to be had. Instead, the players are intent on exploring the lengths and depths of their instruments: Hubsch's tuba blatts border on bass wobble, while Spieth settles on more of a trad jazz freak trumpet flavor, whose conventiality makes the proceedings seem more bizarre. The strength and adventurous spirit of these five musicians makes it seem like they are actually breaking new ground, instead of recycling hashed-over micro-genres, and what we're left with is a mixture of free-jazz fire sermon with a San Fransisco Tape Music Center backing band, or a mariachi quintet covering Lustmord. Its unlike anything you've ever heard; they will ignite odd movies in yr mind, if you give them the time of day. The production is superb, giving equal time and temperament to both the higher and lower registers, making for a full, lush recording. You are practically transported to the small wooden rooms these recordings were inevitably made in. The blurry light photographs by Axel Haller on the cover are also quite lovely, and set you in the mood to travel to these Teatros Grottesco. If ever you were looking to sneak a peak at what improvised electro-acoustic could sound like, or if yr a classical or jazz buff and you'd like to hear what else yr beloved brass instruments are capable of, look no further. Highly recommended.